Sal & Dom’s proudly offers a vast array of cookies including traditional favorites, such as pignoli & rainbow. Our assortment of cookies includes a variety of jelly fillings that are combined w/ several different cookie dough's so they have distinctively different tastes. Cookie trays may also be ordered in a range of sizes. 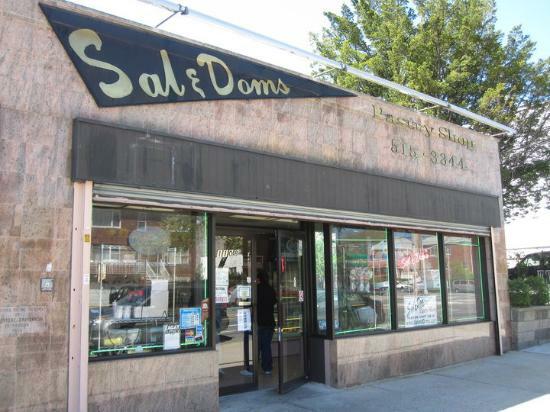 Sal & Dom’s produces a full complement of breakfast items as well. Donuts, buns, croissants, turnovers, Danish pastry, & a variety of muffins all baked fresh daily & on premises. Our variety of large pastries is comprised of the classic Italian standards such as cannoli, sfogliatelle, pasticciotti & rum baba, as well as the American standard pastries including napoleons, éclairs, cream puffs, fruit tarts, & lobster tails. Complementing our large pastry selection is a full line of miniature pastries. Our customers can enjoy an even greater selection of pastries & variety of delicious creams. Cheesecakes are our favorite at Sal & Dom’s. From our traditional Italian ricotta cheesecake, creamy New York cheesecake, Carnegie cheesecake (covered in chocolate mousse), chocolate marble cheesecake, or our legendary strawberry cheesecake, it’s a cheesecake lover’s fantasy come true. Seasonally you’ll also find our red velvet & pumpkin cheesecakes as well. Our dessert cakes can accommodate a variety of different tastes including strawberry shortcake, chocolate mousse, white chocolate mousse, tiramisu cake & of course our red velvet & cream cheese. We also provide a variety of flavored butter cream cakes. Whether it be our rich chocolate ganache, creamy carrot cake, or our fresh fruit cakes, all our dessert cakes are tastefully decorated & mouth-watering terrific. We have proudly been a small part of generations of family’s special days. Our birthday & occasion cakes are available in dozens of arrangements including our standard vanilla & chocolate custard combination & our world famous Cannoli Cream. Our rich chocolate Devil's Food sponge or our moist Chiffon sponge can be combined w/ our different creams, mousses & fruit fillings for an almost never ending assortment of tastes. We also feature our signature Napoleon cake & our outstanding new comer Red Velvet w/ Cream Cheese. We can customize your cake w/ your own photo images, or themes to make it the centerpiece of your party.